Seattle is home to the rare art form of freehand stone wheel engraved crystal – but not for long. 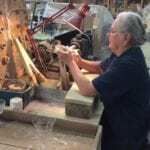 Though Kusak Cut Glass Works has made Seattle its home for over 104 years, the business closes within the next couple of months. Cynthia Brothers, Vanishing Seattle Founder and KBCS’s Yuko Kodama take a tour of the workroom and chat with shop owner, Chuck Kusak about the business’s origins. Special thanks to Jesse Callahan for editing this highlight.